U.S. Embassy Compound In Libya Shut Down Amid Fighting : The Two-Way The State Department says personnel are being moved to an alternate location amid an escalation of fighting among rival militant factions in the capital, Tripoli. 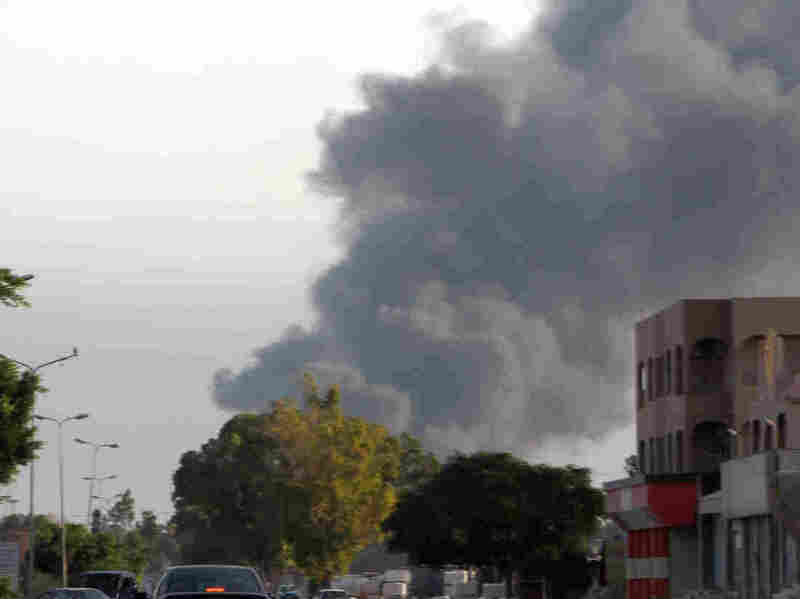 In a photo taken on Thursday, smoke rises from a residential area in Tripoli, Libya. Deadly clashes erupted between Islamist fighters and pro-secular militias earlier this month. Updated at 9:05 a.m. ET. The U.S. has temporarily closed its embassy in Libya and evacuated diplomats amid what is being described as a significant deterioration in security, with rival militant factions battling in the capital, Tripoli. "Due to the ongoing violence resulting from clashes between Libyan militias in the immediate vicinity of the U.S. Embassy in Tripoli, we have temporarily relocated all of our personnel out of Libya," State Department spokeswoman Marie Harf said. "Securing our facilities and ensuring the safety of our personnel are top department priorities, and we did not make this decision lightly," Harf said. "Security has to come first. Regrettably, we had to take this step because the location of our embassy is in very close proximity to intense fighting and ongoing violence between armed Libyan factions." In a separate statement, Pentagon spokesman Rear Adm. John Kirby said: "[All] embassy personnel were relocated, including Marine security guards who were providing security at the embassy during the movement." "During movement, F-16s, ISR assets and an Airborne Response Force with MV-22 Ospreys provided security," Kirby said in the statement. "The mission was conducted without incident, and the entire operation lasted approximately five hours." The Associated Press says: "The withdrawal underscored the Obama administration's concern about the heightened risk to American diplomats abroad, particularly in Libya where memories of the deadly 2012 attack on the U.S. mission in the eastern city of Benghazi are still vivid and the political uproar over it remain fresh ahead of a new congressional investigation into the incident." A newly issued travel warning issued today by the State Department said the Libyan government had been unable "to adequately build its military and police forces to improve security." Secretary of State John Kerry, holding talks in Paris with his Turkish and Qatari counterparts on the situation in Gaza, called the closure of the embassy in Tripoli temporary, Reuters reports. He said Turkey had also removed about 700 of its personnel from the North African country. "Black plumes of smoke marked shell blasts and bulldozed earthen barricades mapped out the frontlines around Tripoli's largest airport, now at the heart of a standoff between the country's powerful militias. "With barrages of Grad rockets, anti-aircraft guns and artillery fired at their rival enclaves just kilometers apart, brigades of former rebels have turned parts of southern Tripoli in a battleground for nearly a fortnight. "The clash over Tripoli International Airport is the latest eruption in a deepening rivalry among bands of ex-fighters who once battled side by side against Muammar Gaddafi, but have since turned against each other in the scramble for control."